In 1962 London Transport's Country Area was contemplating how to replace some of their RTs with higher capacity vehicles for their trunk flows. 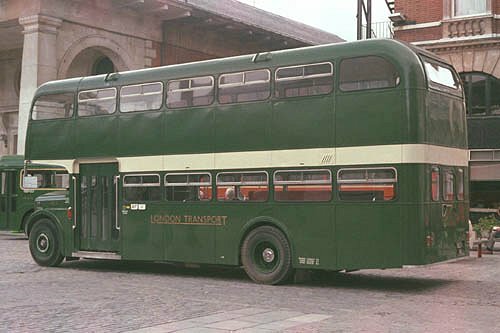 The RML was one obvious answer - and the one eventually chosen - but there was a certain amount of consideration whether the relatively sophisticated Routemaster was suitable for the purely suburban nature of the Country Area's requirements. It was a rehash of the queries about the use of the RT in the Country Area. Routemasters were expensive too, both in first cost and in running fuel costs: automatic transmission was not cheap. So alternatives were considered. The relatively basic AEC Renown came under the microscope, and a demonstrator was borrowed for a year. The first sixth months were spent under the auspices of Chiswick, and then in February 1963 it went to Northfleet for use on one of the target routes: the busy 480. 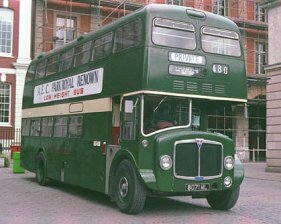 The bus had a conventional low-floor chassis, with an AEC AV590 engine and Monocontrol gearbox. The low floor enabled two "normal" decks to be incorporated within a low-height envelope. The doorway, in the fashion of the time, was near the front.It wore green livery with a cream band, with neither fleetnames nor fleetnumber. However, it was widely known as RX1. The running trial lasted four months, and then it returned to Chiswick for evaluation. In August 1963 it was returned to AEC. The type was not considered a success by London Transport, nor by most other operators. AEC sold it to Osbourne's of Tollesbury in Essex, who used it on their Colchester service for very many years. They had a good buy. After that it was bought for preservation, and spent some time at the Oxford Bus Museum. 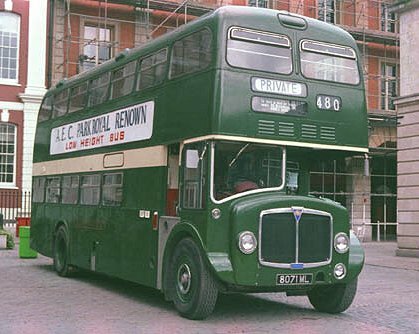 It was restored to LT green and cream, and was rallied with London Transport fleetnames and RX1 fleetnumbers applied. RX1 in preservation, with added London Transport fleetnames and fleet number, at Covent Garden 30th May 1983. Photos kindly supplied by Andrew Colebourne. This list is not complete or up-to-date, and may contain errors.